Boots on the ground and organized information are two of the most valuable tools in mitigating disasters on the ranch. 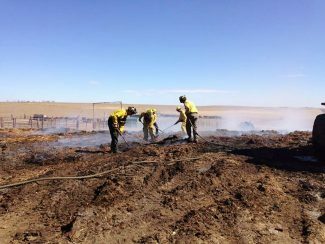 A cooperative response between local fire departments and farmers and ranchers ultimately extinguished the Logan County (Co.) fires. Courtesy photos. The smell of smoke, the smell of rain, the ominous gray of a blizzard cloud. Mother nature usually gives a few hints about impending disaster, but often the window of opportunity to react is pretty tight. Ranchers are no strangers to natural disasters and caring for livestock through fires, blizzards, and even floods. Preparation, cooperation, and information are the three priorities experts say can allow ranchers to best manage livestock through the worst of times. Corey Sloan, Deputy Emergency Management Director, Harrison County (Mo.) Emergency Management, is an incident support expert in rural Missouri. Sloan maintains that producers arming themselves with information is often the best plan in preparing for multiple types of disasters common in rural areas. Emergency personnel need livestock owners to have accurate inventories of livestock as well as any hazardous or flammable materials on the farm or ranch. Often challenging in wildfire situations in which the fires move quickly, Sloan suggests having knowledgeable personnel available outside of the immediately affected area that can assist in evacuation of livestock if time permits. Checklists, Sloan said, are also helpful to organize priorities and procedures for families, volunteers, and employees who may be a part of evacuation efforts. These can include contact information, possible evacuation routes, maps, and a list of whatever information may be vital. "Checklists are straight forward and easy to read," Sloan said. "It's a good way to organize information and make it available to employees and others." 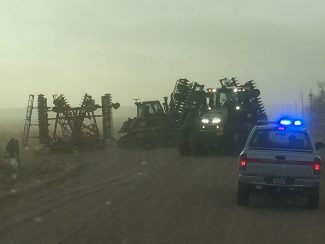 Other information and items to gather prior to an emergency include livestock identification and management records, basic handling equipment, medications, and safety and ensure that emergency items are in each vehicle. Ranchers are excellent at deftly managing extreme temperatures and winter storms, something ranchers are accustomed to and able to prepare for but wildland fire is a different beast. "There's going to be situations you can't prepare for," Sloan said. "You have to understand the basics of fire behavior. There are several online courses through FEMA to help you understand how fire moves and how fire burns in a wildland situation. As a farmer or rancher, you can educate yourself on that hazard specifically." Sloan recognizes that many times in rural communities, volunteer firemen are among the first to respond and are often fighting to save their own property. This familiarity with the area and the ease with which they are able to communicate with neighbors and emergency personnel is a boon. Terry Fankhauser has been the face of the Colorado Cattlemen's Association (CCA) in a number of natural disasters in the state that affect livestock, most recently he was on scene assisting after the Logan County fires. Being at the helm of a resource in a state as diverse as Colorado has presented challenges but the cooperation of rural communities has proven over and again to be valuable. Social media, he said, has changed the face of disaster response. "Social media has changed everything," he said. "In 2007 we had a big blizzard in southeastern Colorado and we were coordinating getting hay into people and the social media piece has changed everything." 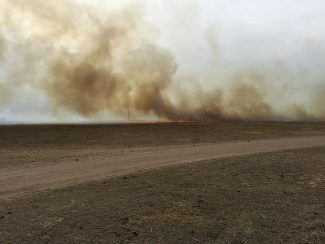 In the hours after the Logan County fire in northeastern Colorado, a Facebook group was established and began coordinating hay donations and disseminating information faster than possible previously. In the midst of wildfires, the Emergency Response System springs to action. The system, made up of local law enforcement and fire among other agencies, is precise and organized into a clear chain of command, explained Fankhauser. In Colorado, wildfires are vastly different depending on the location. The CCA responded to fires in Chaffee County, in the high country, where Fankhauser said fires burn slowly and for a longer period than on the eastern Plains and other Plains states. Reponse to a fire in that area can be working with the state veterinarian and other agencies to gain access to areas to check on and feed livestock. "We have to take into consideration human health and safety," he said. "Working with the command allows us to safely access livestock despite closed roads." Alternatively, in the plains, fires move much more quickly and there are oftentimes fewer homes in a concentrated area but the amounts of livestock in these primarily agricultural areas are higher. Early in the time following disasters, supplies, equipment, and people are able to be managed at the local level adeptly. The CCA can be of assistance in coordinating calls, outside trucking and donations, and procurement of whatever resources are necessary, especially, Fankhauser said, as people are also trying to take care of their own. In working with the state veterinarian through a number of disaster situations, CCA has identified the need for a local, livestock savvy individual in each county to receive some basic training to help ranchers in emergencies. This individual can also be a part of local trainings and meetings to be a part of the emergency response team and be familiar to the procedures when it becomes vital. Including cattlemen on the emergency response team can mean fewer livestock losses in the end.